An industry representative says Southeast geoduck clam divers have not been affected by China’s recent ban on West Coast shellfish import since they haven’t been fishing recently. According to Southeast Alaska Dive Fisheries Association Director Phil Doherty, other factors have been keeping divers off the grounds since early this month. 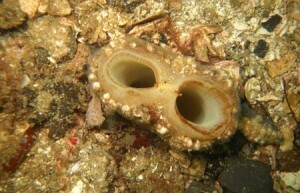 Geoduck Clam siphon showing on the sea floor. Photo by Alaska Department of Fish and Game. In southeast, the state and industry test geoduck clam beds for paralytic shellfish poison on a weekly basis and if the levels are too high, then the fishery does not open. Doherty says that’s what happened the weekend before last (12/7-8). Around 60 divers normally get to fish for just a few hours each Thursday if the weekly tests come up clean. This past weekend (12/14-15), according to Doherty, bad weather prevented divers from gathering the samples. “Due to the storm that we had come through here on Saturday and early Sunday our boats were unable to get out. So, again we’re not going to fish this week cause we did not take any psp samples. So, for the first two weeks of the China problem, we haven’t fished. So it hasn’t really affected our fisheries at all,” he says. KUOW radio in Seattle reported last Thursday that China said was imposing the ban because its inspectors had found high levels of arsenic and the toxin that causes paralytic shellfish poisoning in recent shipments of geoduck clams from Northwest waters.